The Waterways Journal is the oldest continuously published industry trade magazine west of the Mississippi River. It has been printed every week for more than 130 years, with only a few exceptions. That amounts to more than 6,800 weekly issues full of river news over the last 13 decades. Each one of them, except for a handful of issues from the late 19th century, is bound and shelved along one wall of the WJ’s offices in the Security Building in downtown St. Louis. There’s a lot of history in those bound volumes. The original name of the inland marine river industry publication was The River. The first edition of The River contained many of the elements that would persist through the years, including letters from various river cities—Memphis Letter, Paducah Letter, Pittsburgh Letter, etc.—as well as Personal Comment, Editorial Comment, and a story about a new yacht being built for William Randolph Hearst that, it was speculated, would be able to make 30 mph., among numerous other short items. Advertisers in that first issue included the Anchor Line, Eagle Packet Company, Diamond Jo Line Steamers, Mullen & Hopper Painting Company (“Steamboat Painters”), Steinberg Hatter & Furrier in St. Louis, the Olive Street Furniture Company, and others. Most were from St. Louis, in part because that was where the newspaper was published, but also because of the Gateway City’s pre-eminence among river cities. The publication became The Waterways Journal with the April 9, 1892, issue, and with this edition the size was enlarged to tabloid size from 11 by 8-1/4 inches. 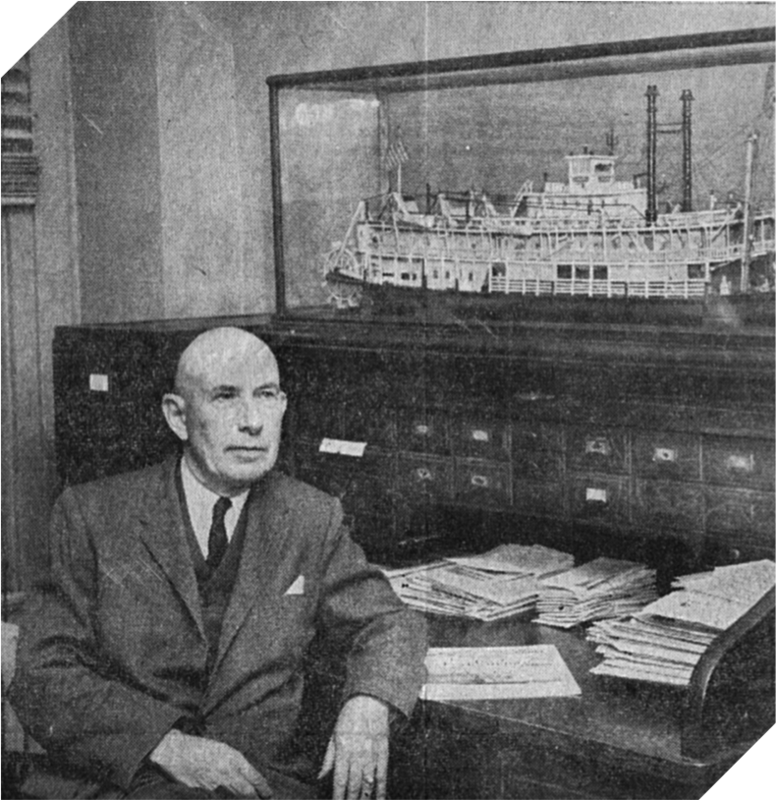 Donald Wright was editor and publisher of the WJ from 1921 until 1965, a period of enormous growth for both the inland marine industry and the magazine. A major turning point in The Waterways Journal’s history came when Donald T. Wright, of Oil City, Pa., became editor in January 1921. The previous month, he had bought the paper and the River Publishing & Investment Company that controlled it. The company was dissolved, and the Journal was the sole surviving entity. Wright took over the Journal when the river industry was still at a low ebb. The paper only had 350 paid subscribers. However, World War I had shown the urgent need for river transportation, and the Federal Barge Line was starting to revitalize towing. Wright was a leader in many river organizations, and the Journal became a spokesman for them and the inland rivers generally. One of his biggest peeves was low bridges, and the inland river industry today owes much to Wright for satisfactory clearances in high water. He led a continuing fight against permits for low structures. On Thanksgiving Day, November 25, 1965, Wright suffered a fatal heart attack. Fortunately, a change in ownership had already been in the works before Capt. Wright’s death. H.N. “Ray” Spencer Jr., a St. Louis advertising executive who had worked with Wright, immediately became the publisher, and the paper continued on a prosperous course as the towing industry grew. Continuing Wright’s tradition, he also supported river organizations in all ways. Ray Spencer retired as publisher of the Journal in July 1979, although he remained as chairman of the company until his death in 1992. He turned the helm over to H. Nelson Spencer, who continued the Journal’s tradition of being active in waterways organizations and river affairs. In 2014, Spencer semi-retired, naming his son, also Nelson Spencer—known as “Spence”—as publisher, while continuing an active role as chairman. 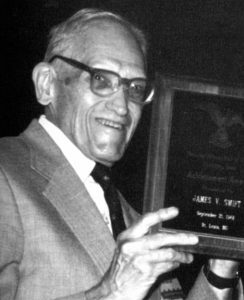 James Swift, longtime business manager of The Waterways Journal and originator of the Old Boat Column. James Swift, who joined The Waterways Journal at the end of World War II in the business department, had a lifelong fascination with the river and river history. Wright convinced him to start writing a column about river history, and the Old Boat Column was born. Each week, the column featured a picture of a historic river vessel, along with Swift’s description of it. It originally ran on Page 8 or 9; in the mid-1990s it was moved to the first inside back page, where it has found a permanent home. Alan Bates, a marine architect who had designed wooden steamboats, as well as an author and historian, took over the column upon Swift’s death and gave it his own flair for 10 years, until he passed away at the end of 2011. Keith Norrington, curator of the Howard Steamboat Museum in Jeffersonville, Ind., now pens the column. Over the years, the WJ has always printed larger-than-usual editions to coincide with major industry meetings, such as the former Mississippi Valley Association’s annual convention, the International Workboat Show or the Inland Marine Expo, among many others. The WJ Annual Review Issue is a longstanding tradition. It features not only an extensive look back at the year’s events, but valuable tables showing all of the boats that were constructed that year, boats that changed hands—even a listing of boat pictures that appeared in the Journal. And since the Annual Review Issue is one that advertisers save their best ads for, the advertising index is a valuable resource for industry buyers in the successive year. Other special issues focus on passenger vessels, dredging and marine construction, shipyards, inland river ports and terminals, safety and environmental stewardship, and more. Until the 1990s, the WJ produced about six or seven special issues a year. Since then, though, we’ve expanded the editorial calendar to feature one special every month. Over the years, Waterways Journal Inc., owner of The Waterways Journal, has acquired several other river-related magazines and journals to complement the WJ’s barge-industry coverage. The first was the Inland River Record, an annual directory of every towboat that operates on the inland and Gulf Intracoastal waterways. The book was begun by Capt. Frederick Way, but the WJ acquired it in 1968. The hard-bound book features information such as the boat’s dimensions, engines, gears, construction date, current and former owners, and much more. It is currently being digitized into a database that will contribute to and support many studies of the barge industry and commercial river activity. In 1972, sensing a need in the river industry, the WJ originated a new annual book, the Inland River Guide. The Guide can best be thought of as a Yellow Pages-type directory, with barge companies, ports and terminals, shipyards and the many equipment suppliers all categorized for easy access. Dan Owen, who joined the WJ upon the acquisition of the Inland River Record, edited both that book and the Guide. After his retirement from the Journal, he continued to edit the Record until he died in 2018. In 1989, the WJ purchased Quimby’s Cruising Guide, an annual directory of marinas and locks on the inland and Gulf Intracoastal waterways. Over the years, the publication has been expanded, and it’s now considered an invaluable resource for transient boaters. International Dredging Review was acquired by the company in 2010. 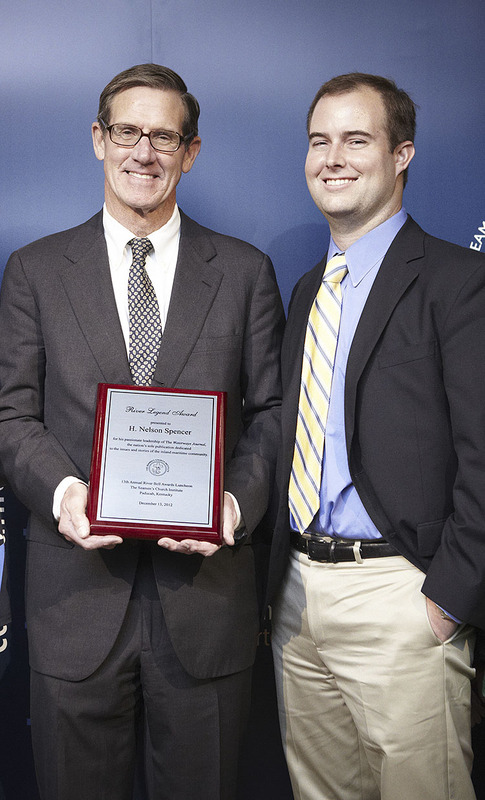 Nelson Spencer, publisher of the WJ from 1979 until 2014, received the River Legend Award from The Seamen’s Church Institute in 2012. He is shown here with his son, Nelson “Spence” Spencer Jr., current WJ publisher. In 2011, Waterways Journal Inc. added another magazine to its stable of publications: Marina Dock Age, a trade magazine for marina operators. MDA complements the recreational focus represented by Quimby’s. Many occasional contributors from throughout the river system send articles and/or photographs to go along with the regular company news featured in our pages. For the last year or so we have sometimes invited readers to submit river pictures for our “photo corner” feature; we were pleasantly surprised by both the quantity and quality of photos that started to pour in, to the point that we have a backlog of excellent shots waiting to be published. Keep them coming—we may have to turn it into a weekly feature! In 2013, The Waterways Journal Inc. entered a new era when it created the Inland Marine Expo, the first trade show and educational event completely focused on the inland waterways marine industry. Besides exhibits, each IMX features nationally regarded speakers on topics of direct interest to the inland marine industry. Evidently meeting a need, the IMX has grown each year since, moving from Union Station to The Dome at America’s Center. For more than 130 years, The Waterways Journal has been the pre-eminent source of news and information for those working in the river industry and river buffs. Through thick and thin in the industry, a new Journal has gone into the mail week after week for more than 13 decades. And we have no plans to slow down!